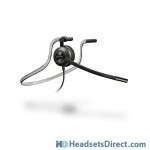 Why You Need The New Plantronics EncorePro HW540 Corded Office Headset? 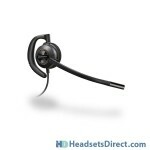 - Headsets Direct, Inc.
Why You Need The New Plantronics EncorePro HW540 Corded Office Headset? 1) The HW540 is a 3-in-1 headset, meaning it’s a convertible headset with three different wearing styles in one headset. You will have great confidence in finding one of the wearing styles to be a perfect fit. 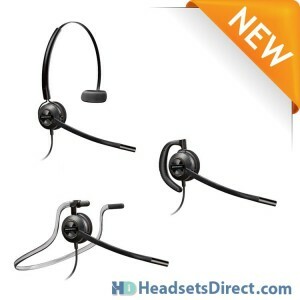 If you’re buying headsets for your company, this also works well, allowing you to provide everyone with the same headset, and they can choose the wearing style of their choice. You’re no longer burdened with the task of asking everyone prior to purchasing how they want the headset to fit…and then having a select few change their minds after receiving their headset…causing another round of buying with returns. With the Plantronics HW540 it’s truly one and done! 2) The Plantronics HW540 has a noise-canceling microphone which works well to cut down background noise, even in the loudest of environments, allowing your caller to hear you perfectly every time. The mic is flexible and easily positioned for perfect clarity and is durable to withstand the toughest of environments. 3) For a comfortable, all-day wearing fit, the HW540 only weighs 22 grams, when configured over the ear, making it the lightest in its class. The ear loop is flexible, allowing you to conform it exactly to the shape of your ear. This greatly improves the fit and reduces instability you generally get with a generic fitting ear hook. A soft foam ear cushion is also included, which makes for a soft contact point against your ear. 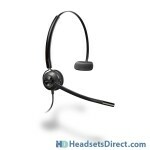 4) As with all Plantronics H-Series headsets, the HW540 includes a cable that terminates in a Quick-Disconnect. This allows you to attach any phone-specific direct-connect cable, USB cable, amplifier, or iPhone cable, depending on your application. With the quick-disconnect, you also have the luxury of pulling the connection apart and walking away from your desk without the need to remove the headset and re-position it each time. 5) Have you made the move to Wideband technology for clearer, richer conversations? If so, the Plantronics HW540 is also wideband compatible ensuring you the best possible audio quality available. If your current phone system doesn’t support wideband, as you upgrade in the future, you will know your headset is ready, and a new purchase will not be needed. 6) Part of the greatness of the Plantronics HW540 will go unnoticed because of the brilliant engineering that went into the design and manufacturing of the product. Plantronics uses laser-welded construction to make sure your investment is long lasting and metal joints to ensure minimal breakage. Key take away: You need to focus on your callers and not worry about how well your headset is holding up and sounding to your callers.